Zoe and Beans are two characters from Chloe and Mick Inkpen who appear in a small collection of books, aimed at young babies and toddlers, all telling of the adventures of Zoe and her scruffy dog, Beans. 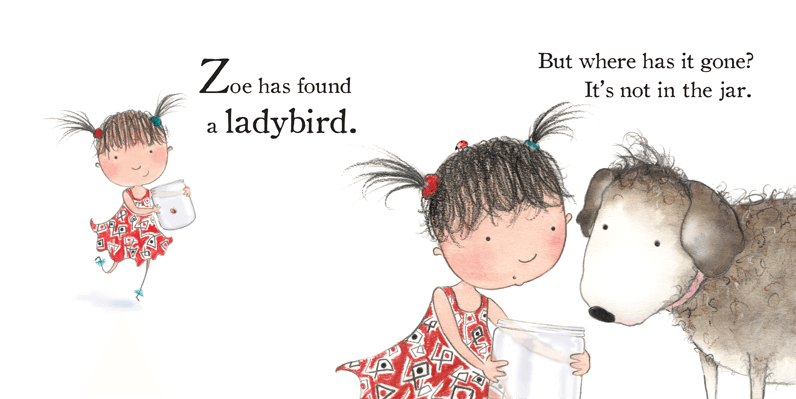 In this book, Zoe has found a ladybird, and put it in a jar. But as soon as she comes to show it to us, it disappears. Zoe and Beans then hunt everywhere for the ladybird and find a lot of other lost things in the process. Look closely at the picture above. Can you spot it? Yes, there is is; a tiny ladybird on Zoe’s head. And that is the premise of the book – the ladybird appears in a slightly different place on every page and can be found with a little bit of hunting. Although the ladybird is tiny it is actually reasonably easy to spot, even for quite a young child. This was extremely popular with the fifteen month old who chose it for a bedtime story most nights it was on loan from the library. It’s a very simple book but lifted out of the ordinary by a few important details. First, the drawings are delightful, and the characters of Zoe and Beans are instantly appealing to young children. Secondly, instead of just being a ‘spot the ladybird’ book, there is a narrative thread that runs through it as Zoe finds other things to put in the empty jar. And thirdly, the language is not neglected (as it often is in books driven by illustrations) but well-crafted and fluent – note the alliteration when Zoe finds “an old penny, a purple pencil, and a soggy pink party popper”. This is a simple but well-made book, ideal for toddlers just beginning to cope with stories with sentences rather than single words per page. You can find out about Zoe and Beans on their website, here. This is a story about security, safety, love and ritual at bedtime. The noises of the rain and the wind outside serve to heighten the sense of warmth inside the little house, and Anita Jeram’s rich illustrations in cosy gold, red and brown complement that perfectly. The text, by Amy Hest, is lyrical without rhyming, and its undulating rhythm captures the tenderness of Mrs Bear. When she finally remembers what he is waiting for the story becomes almost interactive. “And she bent way down, kissing Sam once, and twice, and then twice more. It is almost impossible not to suit the action to the word at this point, and for children who are reluctant to go to bed this walk-through of the process may be especially effective. And nearly all toddlers will love being kissed in kind as they hear the words! As a bedtime story this is ideal: short, gentle, on topic, and ending with a kiss. Nothing fancy or clever, but perfect for its purpose. Spot the dog was created in 1980 by Eric Hill, and Where’s Spot? was the first book in which the little yellow puppy appeared. Hill was given the idea watching a television advert in which his son laughed at the funny pictures hiding behing flaps. 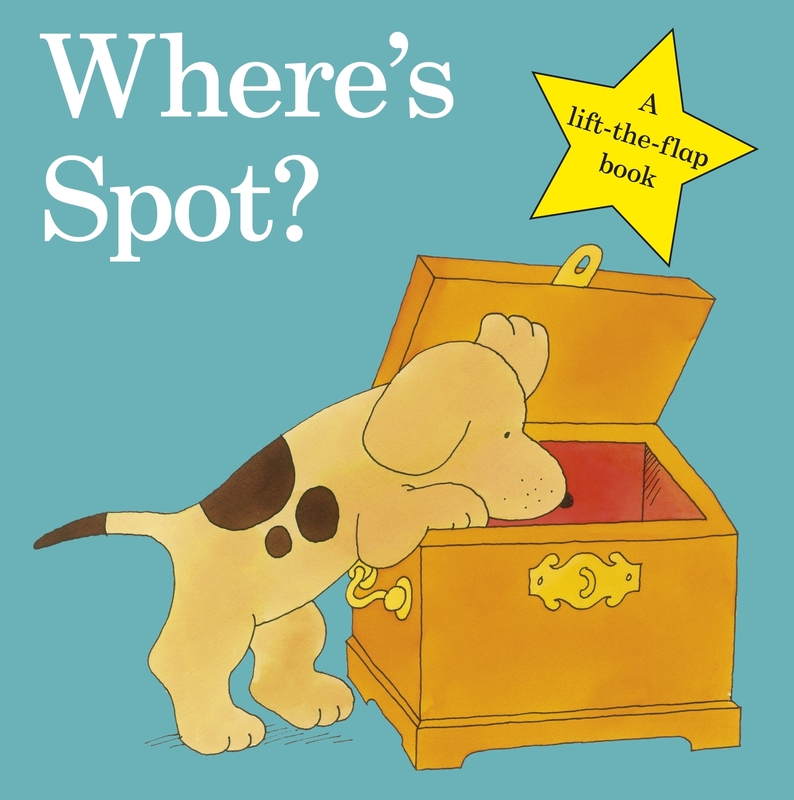 In Where’s Spot? Spot’s Mum Sally goes around the house looking for the wayward dog, whose dinner is ready. It’s laughably simple: each page asks a question about where he is, and when you open the flap he is very definitely not there. The humour comes from the unlikely nature of the animals hiding in the various places. Would anyone really expect to find a hippopotamus in the piano? All the animal says is ‘no’ which leaves plenty of room for first adult and then child to fill in the description of what’s there. All young children love flap books and this one is no exception. There is a reason it’s still popular after thirty-one years! The unexpected nature of what’s behind each flap and the simplicity of the text and drawings make it very appealing even from a very young age. There is even a twist at the end when we think we have found him but it turns out not to be. There is nothing to this classic but a very good sense of what keeps children entertained – and that is precisely why it’s been selling successfully for thirty years. With a page per line and a charmingly simple meter this is a great book for reading with the very young. 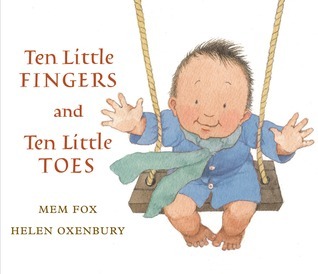 Mem Fox’s text has plenty of repetition and Helen Oxenbury’s drawings of babies from across the world are both cute and beautiful. The premise is that no matter where babies come from (ice, the fields, the town, a tent) they all have ten fingers and ten toes. It’s an easy read and an obvious book to read with your baby – plenty of toe and finger tickling to be had. The story turns to indirectly address the child at the end, making it a very personal experience. There will be issues with this book if you dislike sentimentality but the final invitation to give baby “three little kisses on the tip of its nose” is great fun even for the seasoned and cynical. Babies will benefit from seeing a variety of children of different races and colours and it’s a book that was made for sharing. Both testers here at three years and one year love it. It’s not for those who prefer edgy, humorous books, but there is no denying the simple appeal of this as a book to read to and with your baby from the very early days. Maddy McClellan’s bemused-looking owls tumble through the pages in a short but sweet book for babies and toddlers. Owls playing with my shoes, owls big and small. Each little snippet covers a double page of cavorting owls in an assortment of colours. They are stealing biscuits from the jar, peeping out of the teapot, wearing hats, sleeping in shoes, hanging upside down from lampshade, exploring the watering can and flapping around with balloons. Although the rhyme is very short and simple, there is plenty to talk about in the illustrations and the overall design is bright, cheerful and comical. Every child I’ve seen with this book loves it, especially the ‘dark’ page, consisting of nothing but a few hoots and some little orange owl eyes. This is a great size and length for small children. Small, square and robust, it is ideal for little hands, and it’s just the right length to be worth reading whilst still holding their attention. A delightful little book for the very young. Animals Baby Best Books Reviews Rhyming books Toddler	Maddy McClellanowlsT'wit T'woo!